This is a round flange Conoco Motor Oil porcelain sign. This particular Conoco Motor Oil sign is predominantly yellow with blue text. 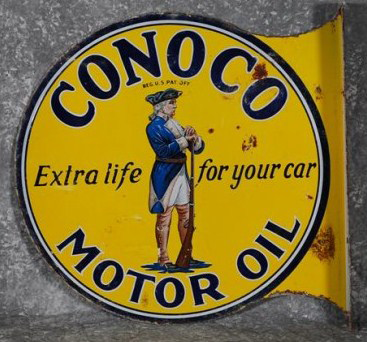 It reads, “Conoco Motor Oil, Extra life for your car” and features a colonial man in the center.